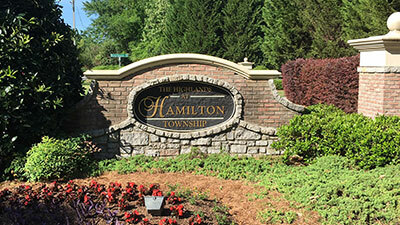 Hamilton Township is a lovely neighborhood of 280+ homes located in Kennesaw, Ga., including Hamilton Township, The Highlands at Hamilton Township, and Hamilton Township Estates subdivisions. Amenity areas include two sets of tennis courts, two pools, a clubhouse, and covered pavilion. The rental fee may be waived for neighborhood functions approved by the Board. Include the reason for the request and the nature of the function. Pavilion easily holds 50 people and is excellent for birthdays, showers and other cozy gatherings. The small kitchen includes a small refrigerator and is located inside the storage room. Clubhouse holds a maximum of 30 people. The clubhouse has a full kitchen with easy access to restrooms. While swim suits are not permitted in the clubhouse, this facility provides a great view of the pool and is great place to host large parties and activities. The non-refundable rental fees are $40 for the Clubhouse and $25 for the pavilion. There is a $50 refundable damage and cleaning deposit. The application must be completed and returned with the rental fee check and cleaning and damage deposit check prior to your use. Hamilton Township guidelines allow a maximum of 5 hours rental time for an event. To begin the process, please fill out the form below.